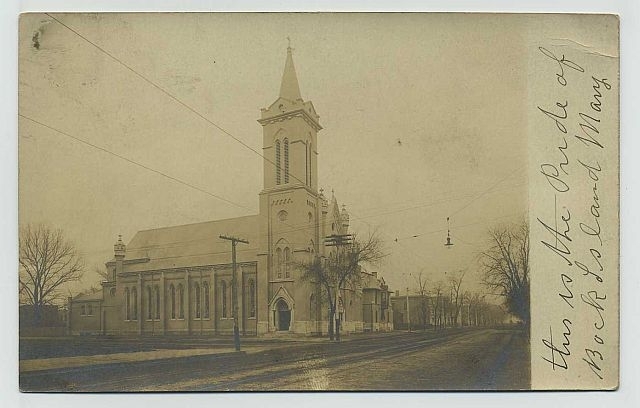 St. Joseph’s Catholic Church, on the southwest corner of 14th Street and Second Avenue in Rock Island, shares a history with both the Presbyterian Church and St. Mary’s Catholic Church. The church and rectory, as they appeared in the early 1900s, are shown on the featured postcard from Shannon Hall’s collection. In 1851, the Rev. George Alleman organized St. James’ church, later renamed St. Mary’s, the first Catholic church in Rock Island County. In the early 1870s, St. Mary’s pastor, Rev. 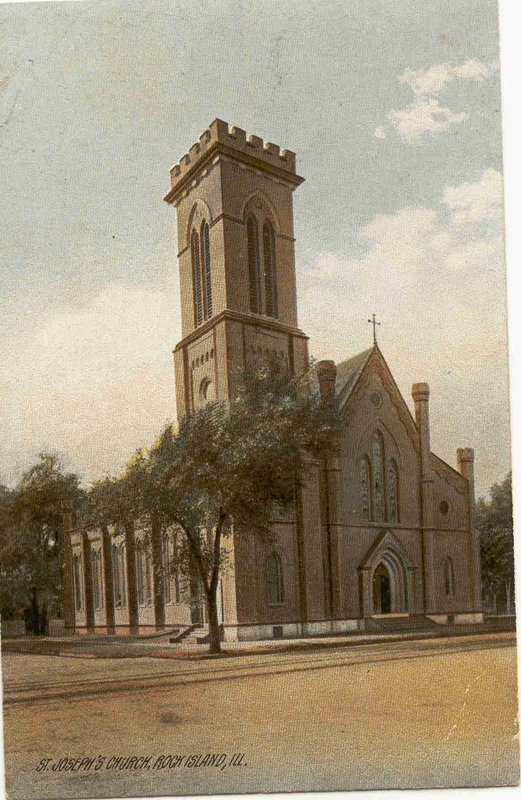 Joseph Roles, organized a second church for the English-speaking parishioners (St. Mary’s was known as the German-speaking church), and in 1874, purchased the former First Presbyterian building for $9000. A vintage photo identified as the original church shows it to have been a smaller, Romanesque influenced style, with simple round-topped windows. The brick walls have a corbelled (protruding) pattern under the eaves and on the tower. There is no steeple, simply a colonnaded open belfry atop a brick tower. That old photo also shows the first rectory as a simple gable-roofed house with the gable end facing the street. 1876, the Argus reported that men were tearing down the old First Presbyterian Church west of St. Joseph’s to make way for a parsonage there. However this may have referred to the Presbyterian parsonage. An 1886 Sanborn fire insurance map notes that the eave height of the church is 30 feet and the tower is 60 feet tall. By 1886, Sanborn map shows a larger rectory at the site. In 1877, Rev. Thomas Mackin was named pastor, a position he would hold until his death in 1905. He was a community leader who was instrumental in the establishment of St. Anthony’s hospital and the incorporation of Calvary Cemetery. He is also credited with opening St. Joseph’s first school in the late 1870s. A sanctuary fire in 1900 may have provided the impetus for the extensive rebuilding that was completed in 1906. At that time, the parish had grown to 2600 people, who lived in the area between the Mississippi River on the north and west, 23rd Street on the east, and “6 miles to the south” which encompasses most of today’s southwest Rock Island area. Rock Island architect George Stauduhar created the design that cost $42,000 to complete. Stauduhar was well known throughout the Midwest for his church designs, usually using Gothic details. At St. Joseph’s, he added a large apse, a semicircular altar area with a tall vaulted ceiling. It was flanked on either side by one-story sacristies. The tower was increased in height to become the impressive landmark that it is today, rising 100 feet in brick with another 20 feet of slate-covered steeple atop that. A large new rectory was built and joined to the church through a shorter tower with yet another prominent steeple. Three minaret-like structures were added at the front of the church, each with a round dome atop a crenellated (notched) upper edge. Gothic peaks were incorporated into the window and door openings. The featured postcard shows the church and rectory at about the time of its rededication ceremony on November 4, 1906. It appears to be a drawing rather than an actual photo, and has a hand-written date of 1907. Although the postcard shows yellow buildings, implying a stucco finish, actual photos of the period reveal walls of dark natural brick. Another undated postcard, this one a Real Photo, shows the church from a different angle with the new rectory present. 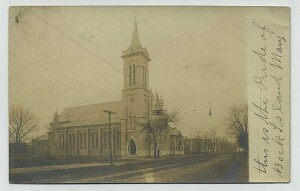 A note on that postcard says of the church, “This is the pride of Rock Island.” A slightly earlier postcard shows a view similar to that on the Real Photo postcard, but without the steeple on the bell tower. A four-story school building, complete with auditorium, was built soon after the church was remodeled. Not until the early 1960s would the church and rectory see another major change. The activity began in 1960, with a new pipe organ. In 1961, St. Joseph’s became the first church in the diocese to be air-conditioned. Work culminated during the next few years with over $200,000 spent on interior and exterior remodeling. The exterior was covered with permastone that obscured much of the early brick detailing and hid the circular tower window. The crenellated tops of the smaller tower and the rectory bay were filled and smoothed, and the minaret tops were removed as well. Yet the overall form and geometry of the church and rectory remains today. On the inside, the tall ornate altars with their “gingerbread” trim were removed. In place of the main altar, a magnificent 36 foot high mosaic representing the Last Supper was installed. It contained over 400 different shades of tile and was the work of Peter Recker, a German artist, who later moved to the United States. The altars were replaced with new ones of French black and gold marble. New stained glass windows were also added. 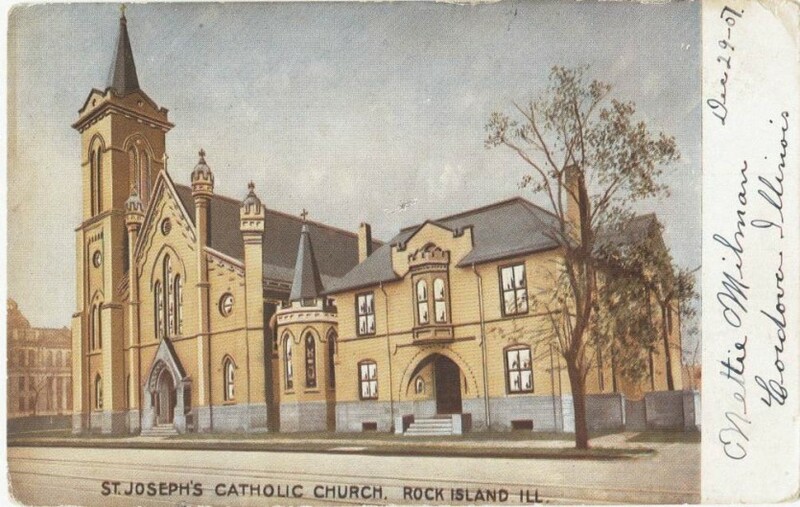 For years, St. Joseph’s was a landmark, its graceful steeple visible from land and river. It embodied our religious, social, architectural and cultural history, and served as a symbol of enduring stability and commitment in one of Rock Island’s oldest neighborhoods. UPDATE since article originally published: Historic St. Joseph’s Church was demolished in early 2007. During the week of April 7, The Argus documented the difficulty the demolition contractor had destroying the bell tower. This article by Diane Oestreich is slightly modified from the original, which appeared in the Rock Island Argus and Moline Dispatch on May 16, 2004.